In 1996, as James Dickey struggled with his impending death and endeavored to overcome it—an effort that had always engaged his imagination— he re-established his priorities. Recognizing that he would die from suffocation brought on by fibrosis of the lungs, he attempted to wring two long poems, “Show Us the Sea” and “For Jules Bacon,” from his earlier works and from his old self, not the drunken genius but the football player and weight lifter, the combat aviator and caring father. The transformation was, in all-important respects, a resurrection. These two lengthy poems, together with shorter poems, are thus, literally, the “last motion” but thematically, these works allude to his previous poetic efforts and summarize his life as death approached. The volume continues the concerns that were always Dickey’s primary interests: family, war, death, and love. Moreover, the poetry echoes, in its images and dramatic resolutions, earlier works. While these poems depict the inevitability of death, they also reveal the redemptive quality of that light and acknowledge the transience of its glory. 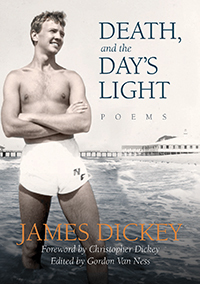 Death, and the Day’s Light, the volume of poetry James Dickey was working on when he died, offers the writer’s final views on love and death, fathers and sons, and war and resurrection. This volume constitutes an invaluable addition to the canon of a major American poet and allows for a complete understanding of his oeuvre.